Leafy seadragons belong to the same family as seahorses, pipefish and pipe horses (Sygnathidae). They growi to about 20-24 cm in length. They feed using a long, pipe-like snout eating planktonic crustaceans including and mysids, shrimp and small fish. When swimming they appear to move through the water like a piece of floating seaweed and can also change colour to camouflage themselves. They are protected in South Australian waters under the South Australian Fisheries Management Act 2007. 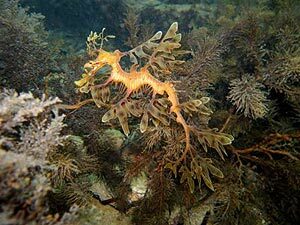 Leafy Seadragons have long fascinated divers who seek to find the highly camouflaged ‘Leafies’ in amongst seaweeds and seagrasses found around clumps of sand in waters up to 50 metres. They are unique to the southern waters of Western Australia and South Australia. Their boney bodies are covered in many spines that protect them from predators. Just like seahorses, it is the male Leafy Sea dragon’s job to look after the 100 - 250 bright pink eggs which the female places onto a special 'brood patch' on their tails until they hatch. of the state of South Australia.